It appears that Charlotte-Mecklenburg Utilities (CMU) may once again have violated state law. Though a state law passed in 1998 requires that the media immediately be informed of a sewer spill over 1,000 gallons, CMU waited almost a month before informing the media about a 45,000 gallon spill to Clark Creek on May 25. An apologetic press release sent out by CMU on June 18 said that the media wasn't informed due to "a miscommunication." There have been a lot of miscommunications at CMU lately. The utility, which is run by the City of Charlotte, initially informed the news media by press release that 1.3 million gallons had spilled into a 10-foot wide stretch of McAlpine Creek on May 23. Though the spill continued for another five days, CMU didn't inform anyone, including Lansbury Court neighbors and state regulators, that the spill had continued and had grown to 4.7 million gallons until May 29, a day after it finally stopped. A CMU spokesperson now says that the utility didn't conduct water quality testing "due to flood conditions." Because state regulators and county environmental staff that often conduct the tests in place of the state weren't informed of the spill in time to conduct the tests, CMU is virtually assured of not receiving a fine for the massive spill, in which 18 Olympic-size swimming pools worth of sewage spewed from a manhole a few hundred feet behind the homes on Lansbury Court off Johnston Road, making its way into stagnant water that sits year-round behind the homes and into a 10-foot wide stretch of McAlpine Creek. CMU spokesperson Cam Coley says the North Carolina Department of Environment and Natural Resources (NCDENR) and the county's Land Use and Environmental Services Agency (LUESA) were informed of the spills by e-mail, but not as quickly as usual or as quickly as they should have been. Coley says information about the May 23 Lansbury Court spill was emailed to LUESA and NCDENR on June 12. Two additional Lansbury Court spills on June 7 and 9 were e-mailed to LUESA and NCDENR on June 11. "Due to the number of recent spills, emergency work and extra crew workload during the past month, e-mails have regretfully been delayed," Coley wrote in a statement sent to Creative Loafing. According to an agreement between LUESA's Division of Water Quality (DWQ) and NCDENR, designed to prevent duplication, county environmental assessors are authorized to respond to sewer spills in Mecklenburg County. 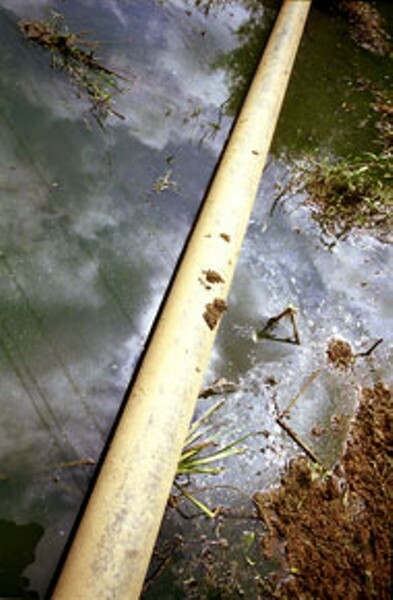 Spill reports and environmental assessments by the county are then forwarded to the state. Until recently, the county water quality program has played a crucial role in the environmental enforcement process because the state rarely sends anyone to investigate sewage spills. But LUESA staff members say CMU hasn't been informing them of spills soon enough after they happen to allow them to conduct environmental impact testing. According to the county's agreement with the state, CMU isn't required to inform LUESA of spills. Lansbury Court residents finally learned about the full extent of the May 23 spill when Creative Loafing interviewed them on June 6. They said that children had played in the 100-foot area where the spill occurred between the manhole and McAlpine Creek in the days after the crews working on the spill finally left. Last year, after criticism that it kept residents in the dark about sewage spills to neighborhood creeks where children play, CMU unveiled a door hanger program that was supposed to be used to inform nearby neighbors that a large spill had occurred nearby. At the time, CMU said it would set no guidelines about when it would use the hangers, but would leave it up to CMU utility crews who respond to the spills to decide when to use them. Coley said that the utility didn't leave door hangers on residents' doors after the three Lansbury Court spills because the creek's flow quickly moved the sewage downstream and because the spill "was in the woods during a flood." The map of the spill location Coley gave to CL showed that the spill occurred less than 150 feet from the residence of one of the families on Lansbury Court.